Where did we leave off? Oh yeah, Gwen made an overtly bullying move towards Mary-Lou, causing Darrell to lose her temper and slap Gwen four whole times! To the modern reader, what Darrell does is wrong because physical punishment is generally considered inappropriate and bullying. In the 1940s it was mostly inappropriate because punishing Gwen was not Darrell’s job, and the issue of the slapping itself is a second one. This seems obvious, but I do think it’s important to point out, because one does see contemporary reviewers becoming really angry that there’s no Very Special Moral about Not Slapping People. TL;DR, Darrell hulks out sometimes. What I love about the internet is that I googled “hulk smash gif tumblr”, and this was my first result. Katherine — she’s the head of the dorm, remember her? You might not, because she’s not remotely obnoxious — calls a first-form meeting! A FIRST-FORM MEETING! That’s North Tower only, because apparently no one from the other towers — or even other forms — were present for this incident. I mean, so I assume, because you’d think one of those “almost grown-up” sixth formers would have had something to say if the first formers started drowning and slapping each other. Gwendoline had gone up to her dormy, to get some cold cream for her red-streaked legs. They didn’t need cold cream, of course—but she meant to make as much fuss as she could! She had always been jealous of Darrell, and she was jolly glad she had got something against her. Coming up and apologizing like that—she didn’t mean a word of it, Gwendoline was sure! Portrait of Gwen in four sentences. The general consensus in the form is that Darrell needs to apologise for slapping Gwen, and, as a secondary but important consideration, she should apologise to Katherine for cheeking her. Mary-Lou was firmly convinced that Darrell was a heroine. She had suffered such agonies under the water, and had really and truly thought she was drowning—and then along had come strong, angry Darrell. How could Katherine judge her anyhow but kindly? Mary-Lou didn’t dare to say any more, but she sat with a worried, anxious look on her face, wishing she could speak up for Darrell bravely and fearlessly. But she couldn’t. The consensus is that if Darrell won’t apologise to Gwen — and Alicia, for one, is fairly cynical about it (‘How I should hate to have to say I was sorry for anything to darling Gwendoline Mary!’) — they’ll send her to Coventry, which is an old-fashioned way of saying they’ll give her the silent treatment and exclude her from the social interaction of the class. Which is a pretty common bullying technique among adolescent girls, but hey, different era. Right? …the door opened and Darrell herself walked in. She looked surprised to see the girls sitting about, silent and serious. Katherine opened her mouth to speak to her, astonished to see Darrell looking so calm. Don’t laugh, but as a child who also had a terrible temper, I basically learned how to apologise from Darrell Rivers. I mean, now my therapist says I apologise too much and need to practice asserting myself, so maybe I took it a bit too far into Mary-Lou territory. But I do think this is the source of my great love for characters who know they’re in the wrong and admit it. The girls, who had looked coldly at Darrell when she had marched into the room, now regarded her with warm liking. Here was a person who had a fault, and who said so, and was sorry about it, and didn’t attempt to excuse herself. Who could help warming to a person like that? Okay, but I’m retching just a little. Things I hate: using third person omniscient to tell us how great the main character is. Mary-Lou crumpled up. Oh! Darrell thought her feeble and weak and frightened. And she was too. She knew she was. She knew that a strong person like Darrell could never really like a stupid person like Mary-Lou. But how she wished she would! Oh, honey, you just need some self-confidence. And a girl-crush on a person who doesn’t think you’re a bit pathetic. Gwendoline opened the door and came in, looking like a martyr. She had undone her hair so that it lay in a golden sheet over her shoulders again. She evidently fancied herself as an ill-used angel or something of the kind. She heard the last few words Darrell spoke, and flushed red. ‘Spiteful people like Gwendoline can’t tease her!’ That was what she heard. Gwendoline was forced to say she was sorry. She stammered and stuttered, so little did she want to say the words, but, with everyone’s eyes on her, she had to. She had never said she was sorry for anything before in her life, and she didn’t like it. She hated Darrell at that moment—yes, and she hated that silly Mary-Lou too! GWEN, WHY YOU GOTTA MAKE THINGS SO AWKWARD FOR EVERYONE? She’s the reason newbies are told to LURK MOAR before they start participating in forums! Irene, who shares my feelings about AWKWARD SOCIAL ENCOUNTERS, flees to a music room. Escapism, baby! That’s the stuff! The others sit around and dissect the events of the last two chapters, and agree that Darrell >> Gwendoline. And I gotta agree — it’s a real shame that Gwen has never been taught how to admit when she’s in the wrong, even to herself, and that she’s apparently never encountered, say, positive social modelling through novels. But I know which one I’d prefer to share close quarters with for most of the year. Gwen sets out to write an angry letter to her mother about Beastly Darrell and Those Terrible Girls. Katherine, faintly amused, says fine, she will also write to Gwen’s mother. Predictably, Gwen storms off in a sulk. Foreigners — SO HILARIOUS, am I right? Meanwhile, Darrell’s fawning gets her promoted to full gang membership, with Mary-Lou taking her place as hanger-onerer. Gwendoline was jealous of the way Alicia and Betty, recognized leaders in the first form, had made friends with Darrell. After all, Darrell was as new as she herself was. And she, Gwendoline, was much prettier, and had, she was sure, much more charm of manner. Sorry, I just realised that Sally is Mai from Avatar. NO WONDER I LOVE HER! As far as we know, Sally is not a goth knife-throwing ninja. Alas. Alicia came up and heard this curious speech. She laughed loudly. Much as I have my standard Alicia-side-eye in place, I like that Gwen’s flaw here is not that she’s good at stuff, but that she doesn’t care to improve. There was only one person worse than she was, and that was poor Mary-Lou. No one teased Mary-Lou too much. It was too like teasing a small, bewildered kitten. Gwendoline saw her floundering about near her, and because she knew Mary-Lou was even more afraid of the pool than she was, she felt a sense of power. She waded over to Mary-Lou, jumped on her suddenly and got her under the water. Mary-Lou had no time to scream. She opened her mouth and the water poured in. She began to struggle desperately. Gwendoline, feeling the struggles, spitefully held her under longer than she had intended to. CONGRATULATIONS, GWENDOLINE, YOU’VE CROSSED THE LINE FROM “TOXICALLY SOCIALLY INEPT” TO “SCHOOL BULLY”. WELL DONE. There came the sound of four stinging slaps and Gwendoline squealed with pain. Darrell’s hand was strong and hard, and she had slapped with all her might, anywhere she could reach as Gwendoline hastily tried to drag herself out of the water. The slaps sounded like pistol-shots. WHY IS THERE NO ADULT SUPERVISION AT THIS POOL? WHAT’S THE STUDENT DROWNING RATE AT MALORY TOWERS? Hateful Gwendoline! Horrid Katherine! 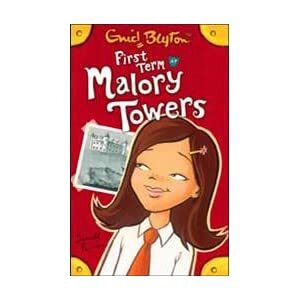 Beastly Malory Towers! But before she reached the top of the cliff and came to the little gate that led into the grounds of Malory Towers, Darrell’s anger had all gone. She was dismayed. How could she have acted like that? And she had absolutely meant always to keep her temper now. and never let that white-hot flame of rage flare up as it used to do when she was smaller. Very much subdued, Darrell went back to the school, dried herself and changed. She had been publicly scolded by Katherine. Nobody had backed her up at all, not even Alicia. She had shouted at the head-girl of her form. She had behaved just as badly to Gwendoline as Gwendoline had behaved to Mary-Lou—except that it must have been sheer cruelty that made Gwendoline almost drown Mary-Lou, and it was anger, not cruelty, that made her slap Gwendoline so hard. Still—anger was cruel, so maybe she was just as bad as Gwendoline. She felt sorry she had slapped Gwendoline now. That was the worst of having such a hot temper. You did things all in a hurry, without thinking, and then, when your temper had gone, you were terribly ashamed, and couldn’t manage to feel better until you had gone to say were sorry to the person you had hurt, and whom you still disliked heartily. Darrell heard somebody sniffling in the changing-room. She looked to see who it was. It was Gwendoline, dole-fully examining the brilliant red streaks down her thighs. That was where Darrell had slapped her. Gwendoline sniffed loudly. Gwendoline was neither generous nor gracious enough to accept such a natural apology. She drew herself up and looked at Darrell as if she smelt nasty. And that’s where the chapter ends. I have lots of feelings about this, and they’re all kind of mixed up, being the feelings I had when I was nine, and the feelings I have now. So let’s sort them all out with the aid of … Young!Liz! Okay, so it turns out my younger self isn’t all that helpful. Okay, I’m only doing one chapter here because a lot happens in the next one, and also I got about five hours’ sleep last night, and concentrating isn’t really happening. STAY TUNED. I don’t, for the record, hate Alicia. She’s a charismatic character, and the text isn’t always on her side. And, at times, she’s genuinely funny. I just don’t love the way she targets her pranks at Mam’zelle, Wacky Foreigner, or teachers who can’t fight back. People talk a lot about the Weasley twins as bullies, but while some of their pranks go too far, generally they’re targeted at either their peers, or adult authority figures who are generally so humourless as to be ridiculous, or who have enough sense of humour to appreciate the absurdity, even as they’re taking house points. Not so with Alicia! To be honest there comes a point where I don’t understand why Mam’zelle Dupont hasn’t had a nervous breakdown, or at least gone off with Mam’zelle Rougier and the St Clare’s French teacher and formed an Angry Frenchwomen Union. Darrell had good brains and she had been taught how to use them. She soon found that she could easily do the work of her class, and in such things as composition was ahead of most of the others. She felt pleased. So, after the first week or two, Darrell relaxed a little, and did not worry herself too much about her work. She began to enjoy amusing the class a little, just as Alicia did. You can imagine Miss Potts’ joy at this development. DARRELL, YOU ARE SO MUCH BETTER THAN THIS. Meanwhile, the money Darrell’s parents are spending on this education: KIND OF POINTLESS, I GUESS. Betty Hill went much further than Alicia. Darrell sometimes wondered if there was anything she would stop at. There were two mistresses that Betty and Alicia played up to. One was Mam’zelle Dupont, the other was a quiet, gentle mistress who took needlework, and sometimes took prep, time at night. Miss Davies never seemed to realize that Alicia and Betty could play tricks on her. Mam’zelle did realize it, but was taken in all the same. 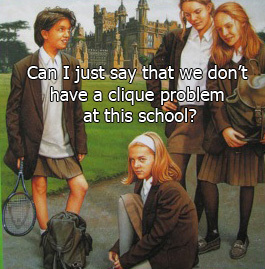 So basically these girls are sociopaths. Then we get a highly amusing story about a time Alicia managed to torture Mam’zelle AND a mouse AT THE SAME TIME! See, just pretending to have blocked ears, that’s kind of eh. Impromptu wordplay? That, I can get behind. Usual Alicia-related caveats applying. Mam’zelle. all unsuspicious of this deep-laid plot, entered the first-form classroom smiling brightly the next morning. It was a beautiful summer day. She had had two letters from home, giving her the news that she had a new little nephew. She had on a new brooch, and had washed her hair the night before. She was feeling in a very good temper. It’s not specifically mentioned, but I can only assume that this is Monday morning. Because damn, Mamzelle’s day is about to go downhill! For starters, her expectations of Gwendoline are way too high. Gwendoline looked doubtful. Since she had been at Malory Towers her opinion of her governess at home had gone down. Miss Winter didn’t seem to have taught her half the things she ought to have known! On the other hand, thought Gwendoline, she had raved over her hair and blue eyes, she had praised the sweetness of Gwendoline’s temper, and said how graceful she was in all she did. That kind of thing was most enjoyable to a person like Gwendoline. But a little more learning would have been very useful to her at Malory Towers. I’m not actually convinced of the sweetness of Gwendoline’s temper, but I’m going to assume Miss Winter was well-paid for saying so. Luckily for Gwen, Alicia’s cue comes up. ‘What do I fear? Why, nothing, Mam’zelle,’ said Alicia, looking slightly surprised. Somebody giggled and then smothered it quickly. ‘Mam’zelle said “Can you not hear?”‘ repeated Betty in a loud voice to Alicia. ‘Beer?’ said Alicia, more astonished, apparently, then ever. I really do love that whole exchange. IT GOES ON! ‘No, I’ve no gold, only a ten-shilling note,’ answered Alicia, much to Mam’zelle’s mystification. ‘Mam’zelle said COLD not GOLD,’ explained Darrell at the top of her voice. ‘HAVE YOU A COLD?’ roared the class, coming in like a well-trained chorus. ‘Ah—then it has affected your poor ears.’ said Mam’zelle. Darrell repeated this question at the top of her voice, followed by Betty. ‘Oh—when did I have it? About two years ago,’ said Alicia. Sadly, though, Malory Towers’ classrooms aren’t soundproofed, and Miss Potts, taking maths in the room next door, is unmoved by Alicia’s affliction and punishment is threatened. Um, Miss Blyton? I think you’re working too hard on your chapter titles. I don’t want you to strain something there. We have a brief description of the dormitory, where the girls all have different-coloured eiderdowns on their bed, and the sound of the ocean can be heard from the window. And, luxury of luxuries, the wash basins have cold and hot water! (No mention is made of actual bathrooms. Do students at boarding schools not bathe? BECAUSE THESE GIRLS SWIM IN SALT WATER! Is this where that stereotype about the British having terrible hygiene comes from? The girls were busy unpacking their small bags. Darrell opened hers. She shook out her night-dress. She took her face-flannel, her tooth-brush and paste. Dear Miss Blyton, I really do think it would have been okay to have a longer sentence in the middle there. On the other hand, repetition is supposed to be a useful tool for children learning to read, so maybe Enid knew what she was doing. Kind of awkward, though. One of the girls looked at her watch. ‘Get into bed, everyone!’ she ordered. She was a tall, dark girl, quiet in her manner. Everyone but Gwendoline scrambled into bed. Gwendoline was still brushing out her fine golden hair. She was counting as she brushed it. ‘Hey, you new girl—what’s your name—get into bed!’ ordered the tall dark girl again. There was silence in the room. Sally Hope gave a little sigh. Darrell wondered if she was asleep. The curtains between her bed and Sally’s were pulled back. No, Sally was not asleep. She lay with her eyes wide open. There were no tears in them, but her face looked sad. ‘Perhaps she’s homesick,’ thought Darrell, and thought of her home too. But she was too sensible to be silly about it, and too excited to be at Malory Towers to miss her home. After all, she had badly wanted to come, and here she was— and she meant to be very happy and have a lot of fun. I really like Darrell, and I like her attitude, and the way this foreshadows that prioritising fun is going to be a problem for Darrell soon — but Sally is a million times more interesting as a character. But Gwendoline was giving little contented snores, dreaming happily of how she would queen it over the girls here, be top of her form, and best at all games. Gwen and her mother really are terribly annoying in their perpetually-victimised-drama-queen roles, and I’ve met and disliked women like that in real life too. But I’m not convinced that Gwen’s dreams of success, however self-serving and unrealistic, make her a bad person. Could it be that the “trendy” current covers are the most accurate? This raises the question, so why do we have all these years and years of covers depicting Darrell with very short hair? Gwendoline left her hair loose over her shoulders. ‘I’ve always had it like this,’ said Gwendoline, an obstinate look coming over her pretty, silly little face. ‘Well, it looks awful,’ said Alicia. ‘My governess, Miss Winter, always liked it like this,’ said Gwendoline, looking pleased. Spoilt AND unsocialised! And completely lacking in sarcasm-detection! Sally gave a little smile. She hardly said a word. She did not seem in the least shy, but she was so quiet and self- possessed that Darrell could hardly believe she was a new girl. She always seemed to know exactly what to do. Also, here we have a rare instance of Alicia saying something nice to Gwen. I think that’s the first time so far. Blyton and weight is fascinating. Stay tuned. Mam’zelle Dupont was short, fat and round. She wore her hair in a little bun on top. Her eyes, black and beady, were never still. She wore a black frock that fitted her perfectly, and well-fitting black shoes on her tiny feet. She was short-sighted but she would not wear glasses. She had instead a pair of long-handled glasses, called lorgnettes, which she wore dangling on a long black ribbon. These she used when she wanted to see anything at close quarters, holding them to her eyes with her hand. I could swear there’s a future book that describes Mam’zelle has having large, flat feet, but I might be confusing her with Mam’zelle Rougier, or the Mam’zelle from St Clare’s. There’s a certain amount of interchangeability. But I really like this character sketch. She’s French, so naturally she’s chic and vain, but it’s nice that the teacher who’s specifically described as fat also seems to be well-dressed and attractive. Though I’m not sure about “beady” eyes, and I spent much of my childhood wondering why so many white people in books had black eyes, when in real life it seemed like only black people and Asians had eyes that dark. It’s traditional in each book that the new girls visit the headmistress, and she gives them a speech is is repeated or recalled word for word through the whole series. Miss Grayling: not actually that spontaneous. Miss Grayling asked them their names, and spoke a few words to each girl. Then she addresed them all solemnly. SPOILERS: Malory Towers will be proud of Darrell. I like the fairly blatant way the text goes, HEY, DARRELL IS GONNA DO PRETTY WELL HERE! HER PARENTS ARE SENSIBLE TYPES WHO DON’T FUSS WHEN THEY ABANDON HER TO STRANGERS! ALSO SHE HAS THE ADVANTAGE OF PREVIOUS EXPERIENCE IN FORMAL EDUCATION! Whatever they might do, in the years to come at Malory Towers, each girl wanted, at that moment, to do her best. Whether or not that wish would last, depended on the girl. EVERYTHING EVER IS GWEN’S FAULT, OKAY? (In fairness, Gwen’s father is a fairly sensible sort, and tries quite hard to rein in her sillier tendencies. Of course these are encouraged by his wife and Gwen’s governess, because women are irrational and don’t know what’s good for them, and Miss Winter is of a lower social class than the Laceys, and you know what those people are like!